The owner of Purple House bakery – known in part for its Montreal-style bagels and ornate pizzas made by a wood-fired oven – is a semi-finalist for the 2019 James Beard Foundation award. In the running for being the best chef in the Northeast, the New Gloucester woman has been a semi-finalist six times: from 2010-2013 during her time at Bresca in Portland, and 2018-2019 with the Purple House, which she opened in December 2016. She was a finalist in 2011. Winners will be announced next week. The parking lot at the 378 Walnut Hill Road venue was packed shortly before noon one day earlier this month as hungry patrons crowded into the 544-square-foot building, which seats eight people. Outdoor seating for about 40 is available in warmer months. 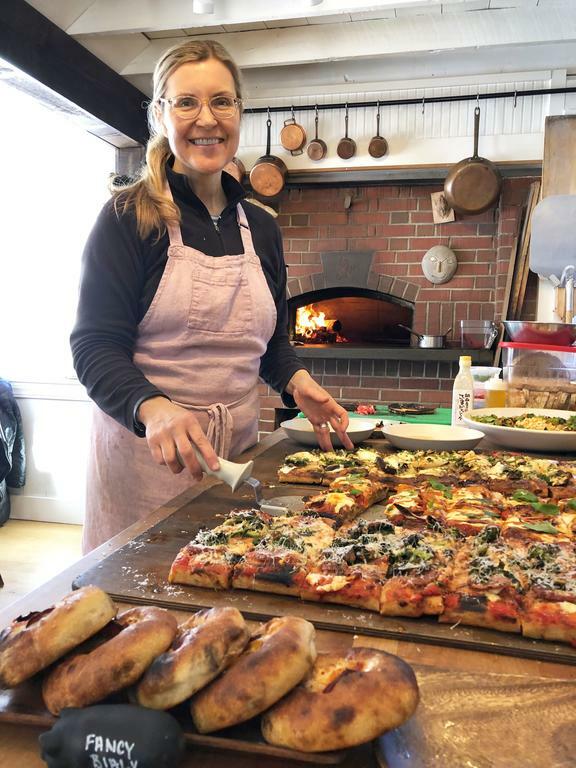 Krista Desjarlais of New Gloucester, owner of the Purple House bakery in North Yarmouth, scoops up a slice of one of her gourmet, oven-fired pizzas. The chef has been a semifinalist for the national James Beard Foundation award six times. The 544-square-foot Purple House is located near the intersection of Routes 9 and 115 in North Yarmouth.